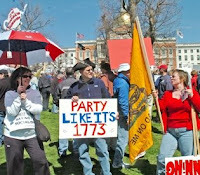 If you get all your news from the networks--ABC, NBC, CBS, otherwise known as the Main Stream Media, or MSM to those of us gamely holding the right flank--you might have missed that about one million pissed off citizens showed up at “tea parties” around the country on April 15th, tax day. You might have missed it because the MSM tried to pretend it wasn’t happening. If a handful of Cindy Sheehan’s Code Pink fruitcakes set up somewhere for a peace protest or fifty lesbian bikers decided to ride down the streets of Fargo to promote gay marriage, the media would be all over it. Not this though. It didn’t fit with their liberal mindset and their mission to do no harm to the Obama Administration. Although this was truly a grass roots movement inadvertently set off by an impromptu rant by CNBC’s Rick Santelli, and demonstrated coast to coast resistance to the policies being promoted by President Obama and the Democrat Congress, the MSM decided it was not news worthy. CNN and MSNBC, long since having given up any pretense of being anything but cheerleaders for Obama, ridiculed the event calling the participants “tea baggers”. This term, I later learned referred to a homosexual act. I hate to admit this since I have gone to college, been in the Navy and attended several county fairs, but I was unfamiliar with the term. Google to the rescue. What cut ups Olbermann and the folks over at MSNBC are! And, thanks to them we have enlightened million of otherwise ignorant youngsters around the country on this important piece of gay trivia. The Democrats, of course, poo-pooed the whole thing, calling it a Republican inspired non-event. Nancy Pelosi said it was not a grass roots movement but an “Astroturf” event. Amusingly, this term originated with David Axelrod, Obama’s campaign manager and advisor, who routinely ginned up non-movements to deflect and confuse his opposition. It reminds me of Hillary and her “politics of personal destruction” charge when she and her cohorts actually invented the practice. Pelosi went on to make herself look even more foolish by saying the people involved were all “rich people trying to get out of paying their taxes”. 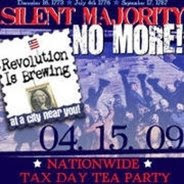 These “tea parties” were not about simply taxes any more than the original Boston Tea Party was about the British Tea Tax. It reflected a real and growing concern that the policies of this Administration and Congress were leading the country in a dangerous, socialist direction with massive spending and intrusion in the economy. Democrats were quick to spout the campaign fallacy that 95% of Americans are getting a tax cut and, in any event, no one’s taxes had been increased. (Yet.) Everyone knows tax increases are coming, although the Dems hope that delaying them until after the 2010 elections will keep them in power. · Bowing to the Saudi King. · Sucking up to the Iranians. · Firing the head of a public company (GM). · Appointing a tax cheat as head of the IRS. · Saying he supports the 2nd Amendment but quietly pushing for gun restrictions. · Pushing a huge carbon tax to finance the takeover of the health care industry. · Talking about nuclear disarmament while North Korea is firing rockets and re-starting their nuclear program and Iran keeps those centrifuges humming. In a curious coincidence, while the tea parties were getting fired up, the “Washington Times” unearthed a confidential Department of Homeland Security document sent out to the FBI and law enforcement warning them to be on the lookout for “right wing extremists”. You might be surprised to learn that if you are an opponent of abortion, an advocate of state’s rights, a supporter of the 2nd Amendment, object to high taxes or are a returning military veteran, you are a potential threat to the security of the USA. The government thinks they better keep an eye on you just in case. That’s comforting. This amazing pronouncement comes on the heels of the same DHS wizards proclaiming that henceforth the word terror will be banished. Terrorism will now be dubbed “man caused disasters” and the war on terror will now go by the newspeak term “overseas contingency operations”. I feel safer already knowing we won’t be offending any terrorists and keeping an eye on those dangerous pro lifers. The big losers in this tea party protest business is the MSM who have further damaged the remaining shreds of their claim to credibility and the Democrat Party. Once again, and in explicit fashion, the leaders of Congress have demonstrated their distain for the American people. The question remains whether the voters will turn out in 2010 and throw a lot of these fools out of office. Fox News covered the events extensively and I think are big winners here. It’s all the more reason for the Democrats to push hard to shut Fox and talk radio the Hell up.